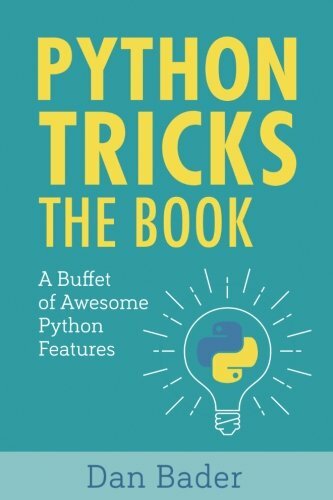 With Python Tricks: The Book you’ll discover Python’s best practices and the power of beautiful & Pythonic code with simple examples and a step-by-step narrative. You'll get one step closer to mastering Python, so you can write beautiful and idiomatic code that comes to you naturally. Learning Python is difficult—and with this book you'll be able to focus on the practical skills that really matter. Discover the “hidden gold” in Python’s standard library and start writing clean and Pythonic code today. If you’re wondering which lesser known parts in Python you should know about, you’ll get a roadmap with this book. Discover cool (yet practical!) Python tricks and blow your coworkers’ minds in your next code review. If you’ve got experience with legacy versions of Python, the book will get you up to speed with modern patterns and features introduced in Python 3 and backported to Python 2. If you’ve worked with other programming languages and you want to get up to speed with Python, you’ll pick up the idioms and practical tips you need to become a confident and effective Pythonista. If you want to make Python your own and learn how to write clean and Pythonic code, you’ll discover best practices and little-known tricks to round out your knowledge. "It's like having a seasoned tutor explaining, well, tricks!" — Daniel Meyer, Sr. Desktop Administrator at Tesla Inc.